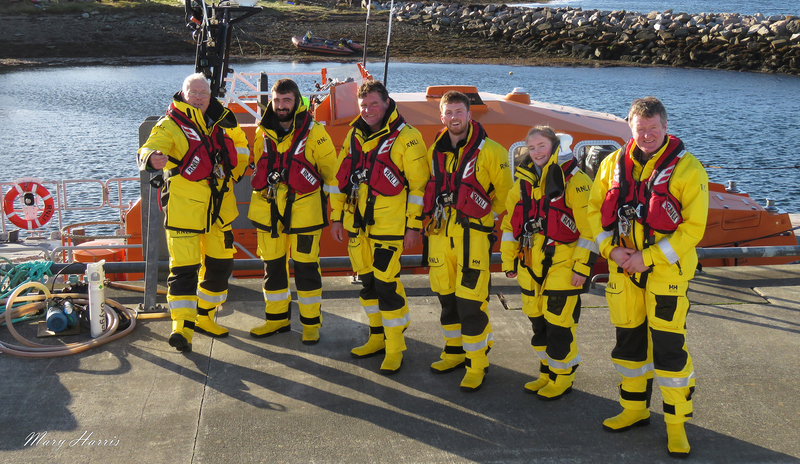 Pictured are second coxswain Colin Bates, Sam Andrews, Steve Rhodes, deputy mechanic Jack Kirkpatrick, Stella Kirkpatrick and coxswain Kevin Kirkpatrick. Longhope Lifeboat crew had a very speedy response to a pager alert on Sunday morning when, during a pre- exercise briefing, the crew was requested to launch by the UK Coastguard. As they were all kitted up and ready to go, the lifeboat was underway in minutes, and heading out of Longhope. They were tasked to attend a dive boat in Scapa Flow where a diver was in difficulties. However, the situation was under control and the dive boat had reached Houton pier as the lifeboat arrived. In case assistance was required, the lifeboat remained on standby until the ambulance arrived and the casualty was transferred. Sea conditions were slight and visibility good. Once the lifeboat had been stood down by the Coastguard, the crew continued with their exercise in the Flow, going through various procedures including a man overboard recovery. The lifeboat was refuelled and ready again for service at 1pm. It was a particularly special exercise as it was the first one for recently enrolled, volunteer crewmember, Stella Kirkpatrick, 17. Stella is the daughter of coxswain Kevin Kirkpatrick and sister of one of the deputy mechanics, Jack Kirkpatrick.